Bad news for the housing market from the National Association of Realtors this morning. 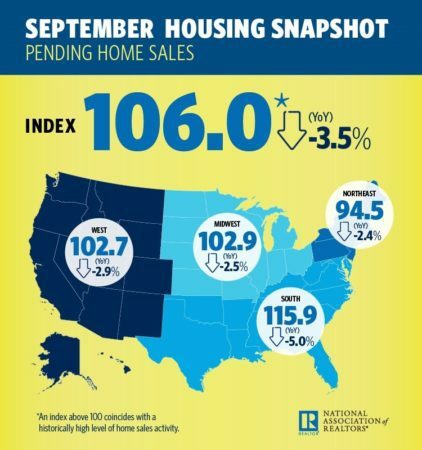 NAR’s Pending Home Sales Index was 106.0 for the month of September, the same as August. That’s down 3.5 percent from last year. And perhaps more worryingly, it’s also the fifth month to see declines in the past six. The index is now at its lowest reading in nearly three years since it hit 104.7 in January 2015. Yun says Hurricanes Irma and Harvey are to blame for the South’s 2.3 percentage point decline in September. “Hurricane Irma’s direct hit on Florida weighed on activity in the South, but similar to how Houston has rebounded after Hurricane Harvey, Florida’s strong job and population growth should guide sales back to their pre-storm pace fairly quickly,” he added. Lastly, Yun says he expects the pending homes sales to continue to slide in the coming months, thanks to the annual decline in inventory during the winter months. Northeast: The pending sales index rose 1.2 percent to 94.5 in September, 2.4 percent below a year ago. Midwest: The index increased 1.4 percent to 102.9, a 2.5 percent drop from September 2016. South: The index dropped 2.3 percent to 115.9, a 5.0 percent year-over-year decrease. West: The index increased 1.9 percent to 102.7, down 2.9 percent year over year.